Sydney, Australia (December 17, 2015) – TDC – Technical Direction Company is bringing Sydney-siders their large-format video projection technology to two huge events this year. 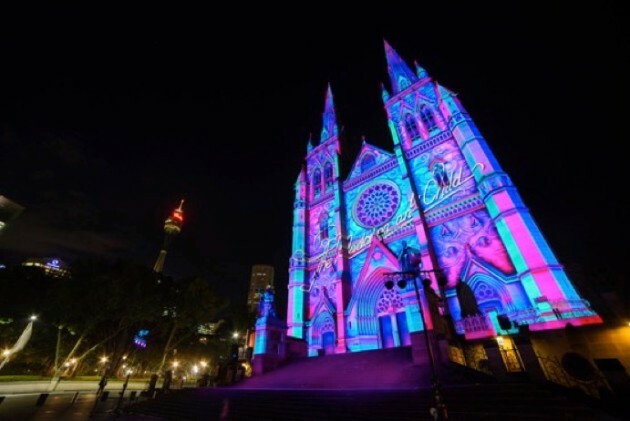 Once again, TDC has used its expertise to turn the façade of St Mary’s Cathedral into a huge 75-meter backdrop of an imaginative representation of Christmas and what it means to Sydney. TDC created astonishing giant 17,640,000 pixel animated images using 264,000 lumens of projected light to illuminate the facade. To manage the full HD content images, TDC’s impressive hardware needs massive processing power – 2 terabytes of content management, 48 cores of processing and 144 gigabytes of RAM. “TDC projection video designers created special code and electronics so that the entire system is‘virtually wired’ and controllable using an iPad device. “Remote monitoring is something TDC has been perfecting for a number of years. It allows for rapid programming, fixes issues remotely in real-time, uses a CCTV camera on-site to see what’s happening and allows scheduling of different shows and operation of each day’s events,” says Michael Hassett, managing director at TDC. Projectors can be turned on or off or even climate control systems can be activated for heating and cooling of all equipment – let’s face it, Sydney can get hot sometimes,” says Steve Cain, head technician at TDC. In its sixth year, Lights of Christmas presented by Payce, is a public celebration generously hosted by the Catholic Archdiocese of Sydney at St Mary’s Cathedral and AGB Events, creating extraordinary experiences. Merry Go Round returns this year to the landmark Commercial Travellers Association Building in Martin Place. Using video projection from TDC, the giant curved concrete façade takes shoppers and local workers on a journey. The building appears to spin and pop as the cast of dancing robots and singing mechanical animals swing into action, before the building packs itself up and blasts off into space as a flying saucer with Christmas lights. The building is the perfect canvas for the artistic work by Ample Projects and runs until 25 December 2015. ‘As with all of our collaborations with TDC, we are very proud of this award-winning artistic and technical achievement. This show presented new design challenges, and we are so proud of the result. We couldn’t have done it without our technical partners, TDC,’ ends Nicholas Tory, creative director at Ample Projects.